I blithely ignored an essential clue as I dove into the job of finding reasons why you should read the poems of my dear friend Fahmida Riaz, translated recently from Urdu into English and made available by Oxford University Press Karachi. What clue? The Walt Whitman epigraph. Result? Many false starts. Agonizing delay in getting this review done. You see, I kept popping Fahmida into too-facile, too-constrictive categories. I called her a Pakistani, which she is–and more. I claimed her as a feminist, which she is–and more. I found other labels: progressive, iconoclast, passionate affirmer of all our loving capacities. None was wrong, but none wholly gives us the pulsing, pluri-dimensionality of her work, the courage and generosity of her mind, the sly wit she applies to every kind of obtuseness. Through her poetry Fahmida Riaz challenges every tyranny that has stood in the way of her claim to personhood: a misogynist social order, regressive interpretations of Islam, military dictators, reductive notions of womanhood, the way poetry should be written in Urdu. As a result, these poems have generated scorn, ridicule, even death threats, as well as admiration. For seven long years her only safety lay in exile, in India. No humility touches her brow. To the state, the nation, the powers that be. And it was all mine! Shores of joy! Oceans of laughter! All for me. In the same old squabble. Do no honour to God. Will shun a loveless land. Such the insight of the Buddha. Why are we, his heirs, so blind? My tears, my brackish tears. Lives God, an alien, not of this earth. As if all within me were desolate and uninhabited? If only someone would come, if only someone would come and knock. How can I open the locked doors of my heart? I run, touching his blue body to mine. My thirst so unquenched, oneness is otherness still. Is the time of union, of true consummation. Such images are commonplace in Persian poetry, but the lovesick poet longing for union with god is, by convention, properly, a man, which Fahmida clearly is not. Not only is "The Rain God" an 'inappropriate' subject for her, the emotional power of this poem is so great that it could not be ignored. Shocked critics resolved their consternation by forsaking professionalism and branding this upstart an obscenity-spouting nymphomaniac. In a puritanical, patriarchal society, Fahmida told me, this is a devastating label. How you have transformed me! That light pours forth from my body. What shall I do, Sire, with this black veil? Why do you bestow on me this great favour? The poet describes all the indignities to which women are subjected, legally, even in their own homes, by supposedly God-fearing men. In effect, they exist only as “objects of great lust.” Rejecting such biological reductionism, she flees. A companion who won my trust. How long will your love hold for me? You will not be with me. The daughter of the wind. There she goes, singing with the wind. If only we could follow her, catch up with her! I could go on and on. Fahmida is a dear friend whose work fascinates me. I want you to run out and buy this book right away, and yet I worry about that, because this volume is seriously flawed. Let me tell you why. 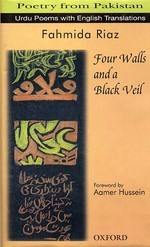 You will have noticed that I have not attempted to deal with prosody, which Aamer Hussein discusses in his admirable “Foreward” to Four Walls and a Black Veil. In fact, it’s utterly impossible to reproduce the sound of Urdu in English, so I decided not to address matters that can’t be verified by most readers of this collection. However, I am delighted to observe how difficult it would be to tell which of these poems has been translated by Rukhsana and which by me, although we did not collaborate. This suggests that we have captured the essence of Fahmida’s poetry. It also means that I, a non-Pakistani, caught precisely what a Pakistani caught, a great comfort to me, considering what I have to say next. You see, I am puzzled by the strange acknowledgment attached to this volume, in which someone is thanked for “having enormously improved the quality of these renditions.” I cannot speak for Rukhsana, but the final version of the poems I translated was prepared last spring, sitting with Fahmida at my dining table in Santa Fe, New Mexico. Sometimes we savored a perfected translation. Sometimes we struggled to find a better equivalent in English. If Fahmida had been dissatisfied with the quality of any passage, we would have resolved the problem then and there. As old friends, we know how to be frank with one another. And “renditions” is not a word she would have used! So who really wrote that passage? In fact, the politics of producing this volume were complex in ways it is painful to relate. An early version of my manuscript was appropriated and turned into a text so toneless, so tedious that I threatened to withdraw my material, every line, every word, with Fahmida’s concurrence, though we both feared such action would scuttle the project. At this point, it seems, I was also supposed to accept a shared by-line, which I also refused. It’s ridiculously easy to tinker with a text someone else has sweated over. So I produced a final draft, as Fahmida, though not the publisher evidently, had planned. The opportunist, obviously, was forced to settle for that strange acknowledgement. In fact, as a proportion of total lines translated, there are amazingly few changes and the majority amount to little more than rearranging deck chairs. At a reputable publishing house, a category to which I would have thought OUP Karachi belonged, such emendations are usually pursued discreetly, anonymously and in consultation with the originator of the material by an ordinary text editor. I would happily have worked with any editor to recaste sense in ways that would do no damage to the grace of Fahmida's poetry. To conclude this painful recitation I must note that yet another name has been linked with mine in the by-line to “In the City Court.” As usual, the interventions are of little substance even as they damage tone, harmony, comprehension. To the owner of that name I say: tinkering, then taking credit, is a form of intellectual theft of which no poet in his own right should be proud. This is all very byzantine and mysterious, but my hope is that a second edition of Four Walls and a Black Veil will rectify all these problems. Or perhaps another press—an academic or feminist press?—may wish to obtain the rights to publish Fahmida in this country. In either case, I stand ready to cooperate. Above all, let us repair the damage. Anything less is unfair to a fine poet who deserves an audience in the English-speaking world.